At this point, it’s very clear that the design of your yacht can be considered a “Classic”. The Corinthian Classic Yacht Regatta is all about celebrating your classic. This is the event created for you and your yacht, family, and friends. It’s a rendezvous; it’s two days of wonderful SAILING; and it’s a fantastic party! When is it? 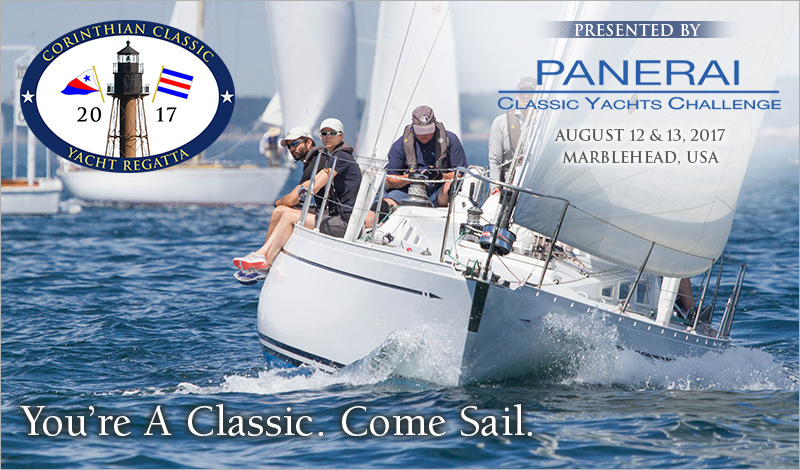 The 2017 Corinthian Classic Yacht Regatta presented by Officine Panerai, will be held on August 12th & 13th. The racing is done in "Pursuit" format - unique, safe, and fun. A good regatta happens on and off the water and you can expect that the Corinthian Yacht Club along with Panerai will put on a good show. There will be a cocktail reception during registration Friday evening; cocktails, dinner, presentations Saturday evening; and of course, more beverages and trophies after racing Sunday. It’s a lot of fun and it’s great sailing. You own a "Classic", now it's time to have some fun with her. Instructions to enter can be found on our website at www.corinthianclassic.org.